Being Gluten-Free Vegan: Taco Tuesday! After seeing the movie Chef, I was inspired to step up my cooking game. I have been so busy with work that I haven't gotten the chance to experiment but I have a few things in the works. I went to a Farmer's Market to prep for some Edith and Herbert pickled veggies and it really inspired me to create a few seasonal produce based dishes. The first one was Okra and Zucchini based and the second was Micro Greens and Fig based. I had decided what I wanted in each taco so I prepped the veggies before I built them. I made enough for two of each- double the okra, onions, and jalapeno for 4 tacos. Slice lengthwise and grill 1 large zucchini (courgette), grill 3 okras, and 3 pearl onions chopped. Cut 2 figs into 8ths. Julienne Jalapeno. 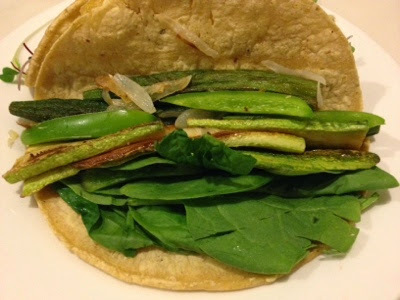 Put spinach on one side of the tortilla. Put half of the onions in the middle and fill with okra and zucchini. Top with jalapeno. Fill the middle of the tortilla with micro greens. 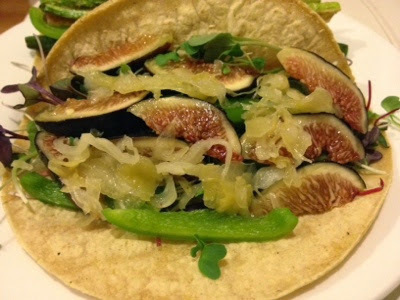 Put figs on top of greens then add the sauerkraut. Top with jalapeno. I drizzled on the Olive Oil and Balsamic from the Caprese salad I had made for some moisture but slices of tomatoes can be used also.